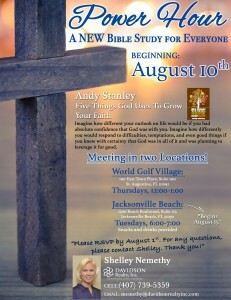 New World Golf Village Bible Study Kicks Off August 10th! Join us as we dive into Andy Stanley’s Bible Study, “Five Things God Uses to Grow Your Faith”! Andy is a senior pastor at several Atlanta churches and an author of more than 20 books. He also founded the worldwide Christian organization, North Point Ministries. Davidson Realty agents Shelley Nemethy and Pam Lareau will be hosting the Bible Studies at two locations and the studies are open to the public. Shelley Nemethy will host the study at the World Golf Village location kicking off on Thursday, August 10th. The six week series will take place each Thursday from 12 to 1 pm. The office is located at 100 East Town Place at the entrance to World Golf Village. Pam Lareau will be hosting the Jacksonville Beach study beginning on Tuesday, August 15th and will take place each Tuesday night from 6 to 7 pm. The beach office is located at 1500 Beach Boulevard, Suite 215. If you would like to participate, give Shelley Nemethy a call at (407) 739-5359 or snemethy@davidsonrealtyinc.com by August 1st so she can have your book ordered for either location!